Fall is here and I couldn't help but start to do a little online window shopping for some new fall staples. J.Crew Factory has so many cute things(as always) and I'm trying to resist buying every sweater and puffer vest I see. I think I am going to finally buy the herringbone puffer this year, I've been wanting to get it for so long and I think I'm finally ready to bite the bullet. I also don't own a pair of booties and I think these Jack Rogers ones are simple but also super cute. Plus, I love that they have a super low heel, so they are perfect for everyday. I also, have been loving wearing long necklaces lately and so I want to get some more fall colored ones and this purple one is just too pretty! Don't be surprised if these items pop up in outfit posts this fall and winter. 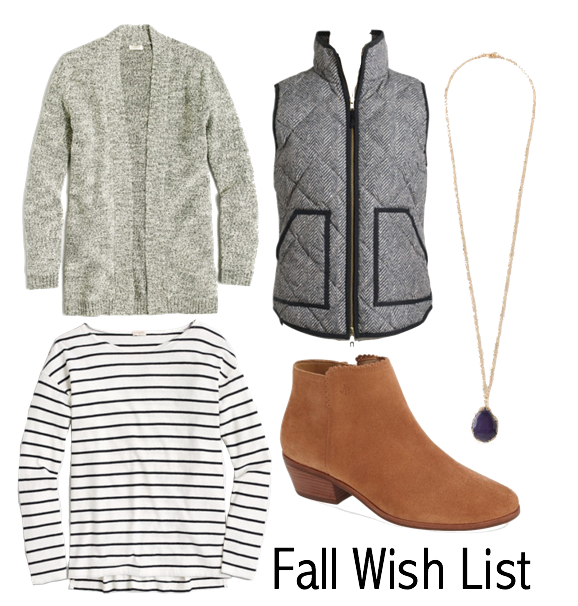 Let me know what is on your wish list this fall? I love that sweater! I have the stripe top and seriously wear it all the time! It's so comfy and a staple! I just bought the stripped shirt, I couldn't resist free shipping haha! Love it!